Joseph, 1976. 1st Edition. Hardcover. Very Good/Very Good. The jacket is a bit sunned and edgeworn. One gift inscription and an ownership signature. Soundly bound. 1977-03-02. New. Ships with Tracking Number! INTERNATIONAL WORLDWIDE Shipping available. Buy with confidence, excellent customer service! Liveright. Hardcover. 0871405903 New Condition. . New. Liveright. Hardcover. 0871405903 Like New Condition. . Fine. London: Michael Joseph, 1976. 376pp. Black cloth boards. Gilt lettering spine. Dustwrapper not price clipped. ISBN 0718115309. Translated by John Shepley.. First British Edition. Hard Cover. Fine/Fine. 8vo. Houghton Mifflin Harcourt. PAPERBACK. 0395252237 New Condition. . New. Liveright Publishing Corporation, 1976. Hard Cover - VG/VG - Book and dust jacket are clean and tight with light wear - Ex-Library - 376 pages.. Hard Cover. Very Good/Very Good. Ex-Library. London: Michael Joseph, 1976. 376 pages. Gold lettering on the spine. Minor wear to the top and tail of the spine. Dust jacket is protected in Brodart, has minor wear along the edges, is price clipped, and faded, has a wrinkled cover where the lamination has come attached - assumed that it came this way. A very good copy of this book, translated by John Shepley, consisting of fourteen contemporary portraits of celebrities in power and dissent (Kissinger, President Thieu, General Giap, Golda Meir, Yasir Arafat, King Hussein, Helder Camara, Pietro Nenni, Mohammed Riza Pahlavi, Archbishop Makarios, Alexandros Pnagoulis, Indira Gandhi, Willy Brant and Ali Bhutto).. Blue Cloth Hardcover. Very Good+/Very Good-. 5.5 x 8.5. History, Statesmen. Michael Joseph Ltd. Used - Good. Ships from Reno, NV. Shows some signs of wear, and may have some markings on the inside. 100% Money Back Guarantee. Shipped to over one million happy customers. Your purchase benefits world literacy! 1977-03-02. Good. Ships with Tracking Number! INTERNATIONAL WORLDWIDE Shipping available. May not contain Access Codes or Supplements. May be ex-library. Shipping & Handling by region. Buy with confidence, excellent customer service! Wilmington, Massachusetts, U.S.A.: Houghton Mifflin, 1977 soft cover in very good condition,crease on cover,light stain,top page edges. Soft cover. Very Good. 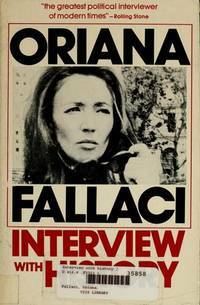 New York, U.S.A.: Liveright, 1976 hardback book and dust jacket in very good to near fine condition. first edition. second printing. 1st Edition. Hardcover. Very Good/Very Good. Houghton Mifflin Harcourt. PAPERBACK. 0395252237 Like New Condition. . Fine. Wilmington, Massachusetts, U.S.A.: Houghton Mifflin Publishing -, 1977. Gd. condition - Life as a political interviewer ... (HA585ml). Soft Cover. Good. Houghton Mifflin Harcourt. PAPERBACK. 0395252237 Remainder mark . Fine. Houghton Mifflin Harcourt. PAPERBACK. 0395252237 . Good. 1977. Houghton Mifflin Harcourt. PAPERBACK. 0395252237 signs of little wear on the cover. . Very Good. Houghton Mifflin (P), 1977-04-01. First Edition. Paperback. Used:Good. Houghton Mifflin Harcourt. PAPERBACK. 0395252237 . New. Houghton Mifflin Harcourt. PAPERBACK. 0395252237 Minor shelf wear . Very Good. Houghton Mifflin, 1976. Paperback. Acceptable. Houghton Mifflin (P), 1977-04. Paperback. Good. Liveright Publishing Corporation, 1976. Hardcover. Acceptable. Disclaimer:A readable copy. All pages are intact, and the cover is intact. Pages can include considerable notes-in pen or highlighter-but the notes cannot obscure the text. At ThriftBooks, our motto is: Read More, Spend Less.Dust jacket quality is not guaranteed. Houghton Mifflin Harcourt Publishing Company, 1977. Paperback. Acceptable. Disclaimer:A readable copy. All pages are intact, and the cover is intact. Pages can include considerable notes-in pen or highlighter-but the notes cannot obscure the text. At ThriftBooks, our motto is: Read More, Spend Less.Dust jacket quality is not guaranteed. Liveright, 1976. Hardcover. Good. Disclaimer:A copy that has been read, but remains in clean condition. All pages are intact, and the cover is intact. The spine may show signs of wear. Pages can include limited notes and highlighting, and the copy can include previous owner inscriptions. An ex-library book and may have standard library stamps and/or stickers. At ThriftBooks, our motto is: Read More, Spend Less.Dust jacket quality is not guaranteed. Houghton Mifflin Harcourt Publishing Company, 1977. Paperback. Good. Disclaimer:A copy that has been read, but remains in clean condition. All pages are intact, and the cover is intact. The spine may show signs of wear. Pages can include limited notes and highlighting, and the copy can include previous owner inscriptions. At ThriftBooks, our motto is: Read More, Spend Less.Dust jacket quality is not guaranteed. Houghton Mifflin Harcourt. PAPERBACK. 0395252237 Item in acceptable condition! Textbooks may not include supplemental items i.e. CDs, access codes etc... . Fair. Houghton Mifflin Harcourt. Paperback. GOOD. Spine creases, wear to binding and pages from reading. May contain limited notes, underlining or highlighting that does affect the text. Possible ex library copy, thatâll have the markings and stickers associated from the library. Accessories such as CD, codes, toys, may not be included.